A fully illustrated 296 page biography by award-winning author, James Robertson, featuring original artwork, photographs and anecdotes from family and friends. Available in hardback and paperback. Michael Marra (1952−2012) was the bard of Lochee, Dundee’s gravel-voiced chronicler of improbable encounters and real human truths, and also one of Scotland’s finest songwriters. Like Robert Burns, whom he greatly admired, Michael was driven by compassion, egalitarianism and a passionate hatred of injustice. His songs are loaded with humour, kindness, anger and profound intelligence. Above all, they celebrate the underdog and the extraordinary lives of ordinary people. Over more than four decades, until his untimely death at the age of sixty, he composed hundreds of songs, including much-loved, idiosyncratic pieces of magic such as ‘General Grant’s Visit to Dundee’, ‘Frido Kahlo’s Visit to the Taybridge Bar’, ‘Mother Glasgow’ and ‘Hermless’ (often described as an alternative, nonviolent Scottish national anthem). He recorded six albums and several EPs of his own, and encouraged and produced the work of many others. He performed his music all over the world and collaborated with an astonishing range of musicians, including Martyn Bennett, the Average White Band, Patti Smith, Saint Andrew and the Woollen Mill, Mr McFall’s Chamber and The Hazey Janes, the band which includes his two children Alice and Matthew. But Michael Marra had a concurrent, overlapping career in theatre, performing, writing and directing, working with poet Liz Lochhead and dancer Frank McConnell, and with Dundee Rep, Communicado and many other companies. He acted in film and on television, was an accomplished visual artist, wrote short stories and plays − and was always inspired, never restrained, by his deep attachment to Dundee, family, friends and − not least − football. 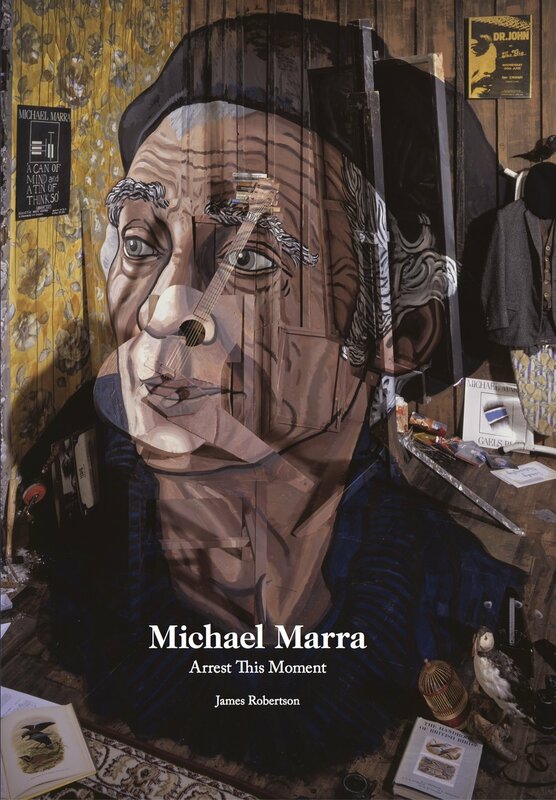 Impossible to categorise, allergic to fame, unimpressed by wealth or status, Michael Marra lived every waking moment as an artist, and touched all who knew him with his genius. In this book, packed with images and anecdotes some of which have never been in the public domain before, the many lives of this unique man are gathered together for the first time. Both Michael’s parents had a great appetite for music, which was part of daily family life: Margaret played piano and sang in both the Cecilian and Diocesan choirs; Edward did not play an instrument but loved jazz and classical music. Duke Ellington and Ludwig van Beethoven were Edward Marra’s great heroes: the only time Michael ever saw his father combing his hair was the night he went to see Ellington and his band play the Caird Hall in 1967. There were opportunities to learn to play music at school and, although money was tight, Edward Marra believed that music lessons were worth paying for. His understanding was that you learned music by a formal process of working your way up through the grades: Chris followed this path but Eddie and Michael took a more recreational route towards proficiency. When Michael was in his teens, Eddie brought home a guitar for him and Chris. Both of them were interested in learning how to play it, taking their cues from the likes of James Taylor and Joni Mitchell. But while Chris would become a professional musician, for Michael instruments were always only a means to an end; and the end was to write songs. If Edward was willing to pay for music tuition, Margaret paid – on the ‘never-never’, which Edward did not approve of – for some of the instruments the boys wanted out of Larg’s Music Shop in Whitehall Street. (However, as Chris Marra remembered, ‘It was my Dad who lled in the H.P. forms for my guitar and amp, the only debt he ever took on. Even at a young age I could understand how it must have pained him to go against his principles for my benefit.’) On one occasion, when Margaret was in Larg’s with a friend, a demonstration was being given on a baby grand piano. As they listened, a salesman spotted them and asked if they were interested in the piano. Margaret explained that she already had a piano at home.The salesman said it could be traded in and asked what make and model she had. Margaret described the Blüthner and asked if that would be good enough. ‘Madam,’ he replied, ‘I think we would be giving you money on such a trade-in.’ When she got home, the stacks of National Geographics and other items were cleared from the top of the piano and it was given a good polish. This is my wee tribute to the great man and was written so that I could use a mouth organ and harness which was given to me by my son Matthew. Bob’s sixtieth birthday is approaching and I’d like to celebrate, maybe a gig with Bob’s songs for the whole night would be good. When I first heard him I thought he was an old man. I would have been about ten or eleven. I was pleased when I saw his photograph (with Suzy Rotolo) because he looked young and he was wearing jeans, then I thought he must be the coolest and most wise young man on the planet. AND he had a girlfriend. I loved the way people put their faith in his vision and took him seriously while enjoying the landscape of his imagination. Dylan sang directly to me, that song-writing was huge, that nothing should be discounted, big songs, ‘Masters of War’ and ‘Hard Rain’, ‘Ramona’. Personal and political.